The typical business working week is from Monday morning to Friday afternoon. Even in these days of 24/7 living, most businesses work a standard 40-hour week. In fact, many work less with a “dress down Friday” leading to a more relaxed day, often with people leaving early to “get home for the weekend”. It seems that many businesses only work four days a week…! Meanwhile, of course, the Internet is alive and well 24 hours a day 365 days a year. Even if you are not in the office or working from your mobile, people are still visiting your website, buying things from you or sending you emails. While you sleep, your business is active on the Internet. New research, however, suggests there is a mismatch between what businesses do and what their customers or potential clients do. 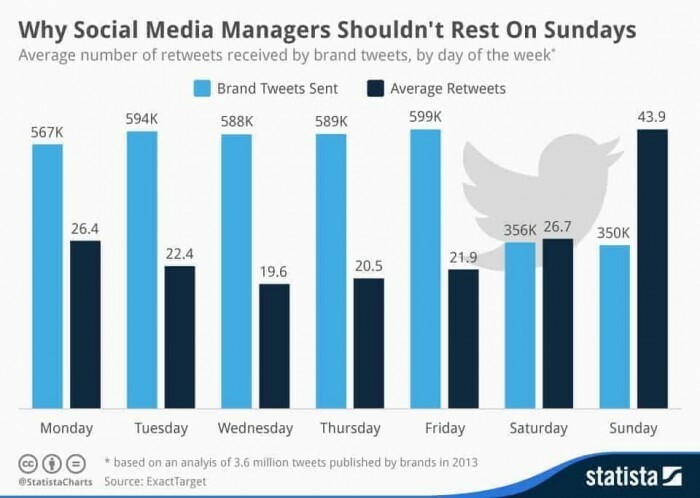 Most Retweets happen on a Sunday, when most businesses do not take part in social media. Indeed, as the working week progresses businesses do more and more social media activity as their customers do less. Then once the weekend begins, customers do more and more social media while businesses do dramatically less. The research shows that the wider public are more active on social media during the weekends, when businesses are at their least active. Much of this could be due to people “catching up” – they were busy themselves working during the week and can only do their social media activity when they have time on a Saturday or Sunday. However, this somewhat misses the point about “social” media. How can a business be “social” with its customers when it is not present? Customers expect you to be able to respond to Tweets, to thank them for Retweets, for instance. Or they expect you to be able to answer questions raised on your Facebook page. Waiting until Monday to deal with these issues might seem OK to a business, but the problem is that by Monday, those customers have largely disappeared from your social activity, only to resurface the next weekend. A study of the Fortune 500 firms a few years ago found that those which engaged “real-time” had an increase in company value over a year, but companies that failed to engage in real-time actually lost value. Firms that were engaging “real-time” had an average 3% increase in stock value over the 12 months of the study; companies that did not engage with the market in “real-time” had an average share price loss of 2%. Yet in spite of this data, most businesses still stick to the traditional Monday to Friday, 9 to 5. Customers are not doing this. They want to engage with your business on a Sunday, for instance. The decision for businesses is not how to get more Twitter followers, but how to change working practices so they truly become a 24/7 company enabling real engagement with their customers.